“Friends, the Grange is a great fraternity, and the lessons of its ritual are expressed by the use of symbols drawn from the field, the farm and the farm home.” This quote is from the Overseer’s charge in the First Degree to remind us of where our ritual comes from. The summer is what I have enjoyed the most on the farm. Haying time has always fascinated me when I cut hay on the sideline. I enjoyed the smell of fresh mowed hay, the birds darting in and out to catch the insects that were stirred up by the haybine. The sound of the tedder fluffing up the green hay, to get it to dry faster, the sound of dry hay as it goes through the tedder sounds like sizzling bacon in a hot pan. The solitude of a hayfield where it gives you time to think, reflect and recite degree parts over and over again. Then the time for bailing depending on the type, you can drop on the ground to pick up later. The kicker which shoots bales into a wagon or bale basket, a trailer that follows the bailer and the bales go up a chute and fall into a big basket type wagon. The best thing is to see people watching the haying activities being performed by you in the field. I always enjoyed the field work but the task of stacking and tossing sticky, dusty bales into a hot, humid loft makes this event a bummer. I have found that the older you get the less tolerant you become to hot weather. I can’t take the heat like I used to. June is a busy time in the Grange. 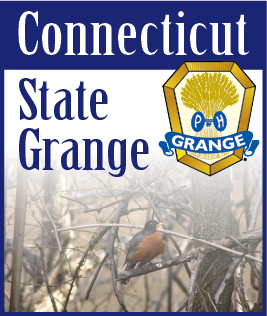 Hope to see you at “Let’s Celebrate.” Judging is on June 10 and Grange Sunday on June 11 at Cheshire starting at 11:00 A.M. with lunch of soup and sandwiches provided by the Youth and Junior Committees and the talent contest at 1:00 P.M. Come and join the fun for the day. New England Grange Sunday at the Cathedral of the Pines in Rindge, NH is always a nice event and is located in a beautiful place with grand views of the mountains of New Hampshire. I was able to visit most of the Pomona Granges to see the conferrals of the Fifth Degree. I like this degree over all the others because of the Specter and the Storms. Yet its lesson is one that we all can relate to every day of our lives. We are getting closer to the redistricting of the Pomona Granges. We are looking for a strong group of Granges to make these new Pomona Granges so they will be able to grow rather than fail and have to do a do-over again. It looks like the number is 3, at this time. Survey Forms before the July 1 deadline. June is the time for families, graduations, weddings, reunions, and vacations. It is always fun to get away with families and friends. Enjoy these times for they are the best of the Grange, our history in the community is the best resource for local history; we know where the skeletons are buried! Pass on the stories so the next generation of Grangers can pass them on to the next. Remember Father’s Day and have a wonderful summer.